A couple days ago I stopped to visit the future location of Cascade Brewing's new pub, catty-corner across Belmont from the Green Dragon. 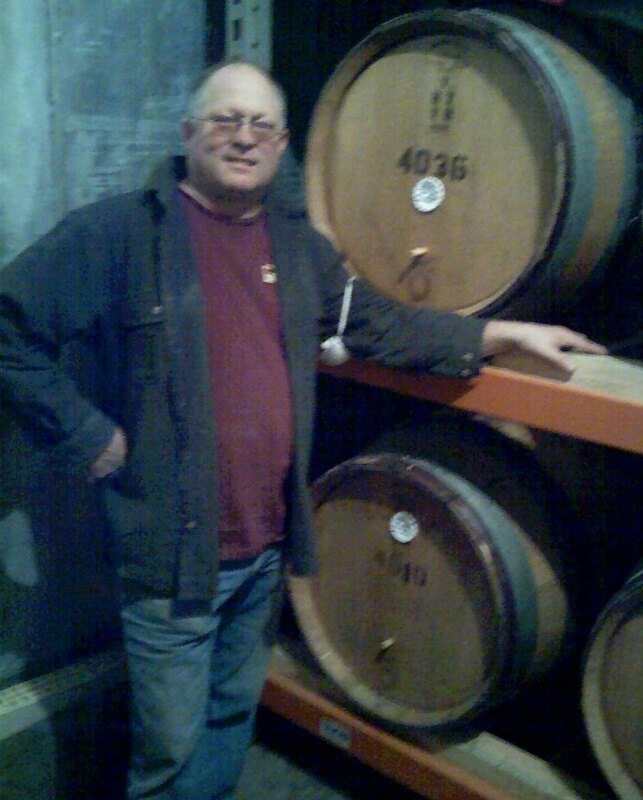 Brewer Ron Gansberg already has dozens of barrels in the beer-aging section of the Barrel House. The rest of the building is still in demolition mode, waiting on permits to begin construction. The pub will have up to 18 beers flowing at one time, a couple of them drawn straight out of wood barrels. As for food, Ron says that the menu will be short and to the point. No decision yet on whether kids will be allowed, but now that the Green Dragon even allows them on the bar side until 8 PM, it probably makes good business sense. There's not a firm opening date yet -- after all, the real construction hasn't yet begun -- but the plan is for "the first part of 2010". I was surprised at how much space there is in the pub side of the building. Everything I had read up to now made me think it would be tiny, and the building doesn't look so big from the outside, but there's quite a big area in there. Some of it will turn into kitchen, cooler, and bar space, but it's still bigger than I imagined. 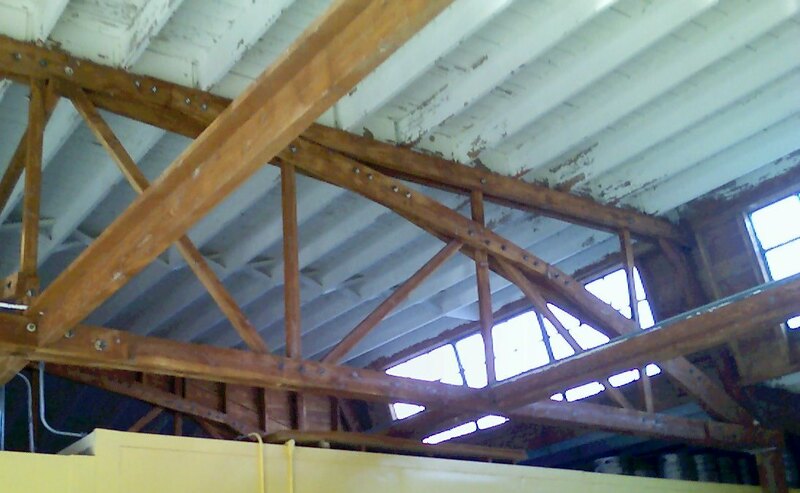 It will have that Lucky Lab warehouse feeling -- check out the wooden arches that hold up the roof. Add to that some outside seating below the loading dock, and you've got a place that's going to fit right in to the vibe of the neighborhood pubs. The original Cascade pub, the Raccoon Lodge, is not that deep into Southwest Portland, but I'm sorry to say that it's enough out of my range that I have never been there. My unintentional boycott has paid off with this pub they're opening within walking distance of my house. I'm excited that we'll now have a range of Cascade's beers in the neighborhood; I guess I better start working on my sour beer palate, since the awards the brewery is harvesting in that category are only going to move them even more in that direction, especially at the Barrel House. This continuing development of the craft beer scene in Southeast Portland is one of the many things that make me thankful to live in this neighborhood. Happy Thanksgiving, everyone! I love sours, and really love Cascades! I can't wait to be able to check out even more of their brews that I haven't yet had. Making the drive out to Beaverton is a bit out of the way for me. And yes, one of the joys of living in Portland alone is the great beers and pubs... Laurelwood, Hopworks.... Cascade.... naming just a few of many.. which are my favorites. Well, I've been known to make fun of sour beer, but I recognize that there's some good stuff out there. I drank a Rodenbach Grand Cru the other day, since there are so many Flanders Reds around Portland, and I wanted to see what the archetype was like. It was really enjoyable. Cascade's Barrel House is going to broaden my horizons even more. Glad to see it! All the kool kids love sour. Get with the program, man!